I have had “live in 4 star style” as a New Year’s Resolution for as long as I have been writing resolutions. The expression obviously comes from the rating system of restaurants and hotels that existed in the years I first started contemplating resolutions. In the 1970s, grade point averages peaked at 4.0 and so did rating systems. But my resolution has nothing to do with living a sumptuous life. In the same way that a quaint, unassuming bed and breakfast might qualify for a top rating because of its uniqueness, quality of service, or the fact that it is situated on a breathtaking ocean bluff, I attempt to live my life in my own personal 4 star style. For me, that means being true to myself and my sense of celebration of life through relationships and an attitude of appreciation. It means things like keeping a gratitude journal, hiding love notes in my husband’s gym bag, adding a personal greeting to that birthday card (not just my signature), and not waiting for a special occasion to use the “good” dishes. It’s about being a little more patient, being a little more forgiving. In classic goal setting terms, this is a ridiculous resolution. It gets points for being a goal that is under my control but how do I make it specific and measurable? I don’t even want to. How do I know when I’ve been successful? I know. There is a certain element of spontaneity that this resolution requires and yet there has to be planning to make it successful. It’s an oxymoron, of some type. Sometimes I lead with my head and sometimes my heart. Even without specific timelines or markers to meet, there are days and times when I know that I have failed miserably. I know when I’ve been too tired or too focused, on myself, to put in the extra effort. I know when I’m just being lazy. But I also recognize when the extra effort turns an ordinary day into something special. Each day really is a new beginning and I like that. And so I enter 2012 with my absurdly undefined and basically outdated (I know I should update to 5 Star Style) resolution. 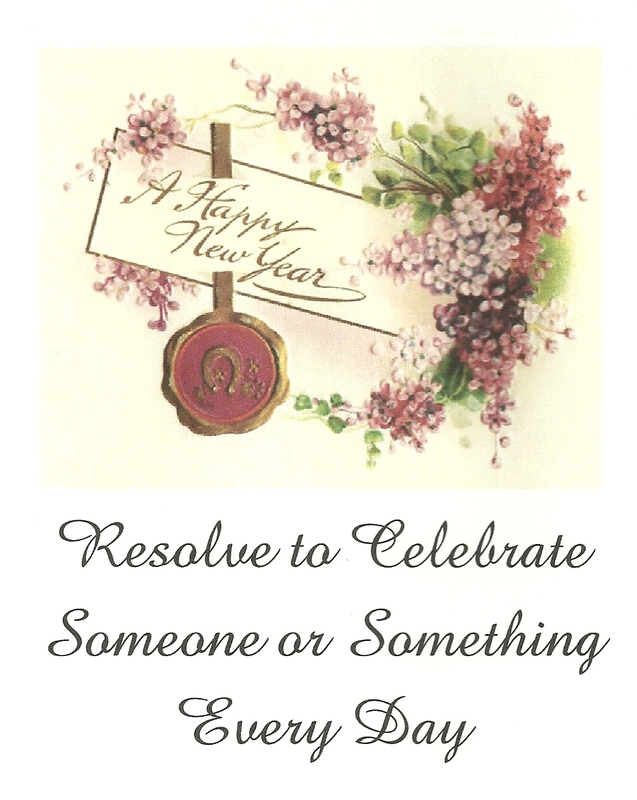 But it is my “old tradition” and it makes a year of 365 or 366 days full of possibilities…. possibilities for celebration. I recognize that my personal philosophy of life has many of its roots in my childhood. While I wouldn’t even pretend to know when or where most of my philosophical paradigms originated, I feel quite certain that a significant one was crystallized for me in the summer of 1964 when I was not yet ten years old. On March 27, 1964, Alaska suffered a devastating earthquake. By that summer, numerous magazines were featuring stories about the tragedy. I had already seen a few articles filled with images of derailed trains, collapsed homes, and pavement left with gaping holes. To ease my fears and some youthful curiosity, my mom and I had spent time talking about the tragedies that typically accompany a natural disaster. She had also taken the time to reassure me that earthquakes were atypical for Maryland, which is where we were living at the time. Soon after this, I came across yet another article related to the earthquake. It was written by a woman whose plans for an Alaskan vacation, with her family, had been interrupted due to the earthquake. The article included a photograph of the woman sitting next to an opened and completely packed suitcase. This was not a story of grim adversity but a story of personal disappointment. I hadn’t suffered any more disappointments than the average 9 1/2 year old, but for some reason that still eludes me, this story weighed heavily on my mind. I recognized it wasn’t as tragic as the stories where people had lost their lives or their homes but it still felt incredibly sad to me. I loved discussions with my mom. Talking to her was always so comfortable. I use the word comfortable instead of easy because it wasn’t my mom’s style to just tell you what you wanted to hear. She was loving, compassionate, and supportive but she was always honest. Even if the truth might sting. So I guess I shouldn’t have been surprised by her reaction to the Alaskan vacation story. She did have sympathy for the family but she wasn’t willing to just let it go at that. “Did they have fun planning for the trip?” she asked. She wasn’t really expecting an answer. She was counting on the fact that I would recall our cherished family planning sessions. My dad would bring home travel brochures and the three of us would huddle around planning just where we would go and what we would see and do. “Did they enjoy the time they spent packing…choosing the clothes they would need for a chilly Alaskan climate?” This time she was counting on the fact that I had always loved my clothes and creating outfits. She knew how much I delighted in every moment spent choosing the perfect bathing suit or pair of sandals to pack for a trip. She wanted me to recognize that even though the family lost their chance at this Alaskan vacation, the wonderful memories they created while anticipating and preparing for the trip, weren’t lost. If those memories were only of family arguments and frustrating moments, then it would indeed be a sad story. I eventually understood what she was trying to teach me. Today is too precious to waste while waiting for tomorrow. That lesson has stayed with me for the rest of my life. I’d like to be able to say that I never waste a moment of today worrying about something that is happening tomorrow….but that simply isn’t true. I forget more times than I’d like to admit. But every time I recognize I’m in a frenzy, caught up in the process of getting through today so I can get to tomorrow, it is the thought of my mom and the image of that packed suitcase, that brings me back to what I know is really important. Throughout my life, my mother looked for ways to show me that life is a gift and each day is worth celebrating. She was a wonderful teacher. I got the message.